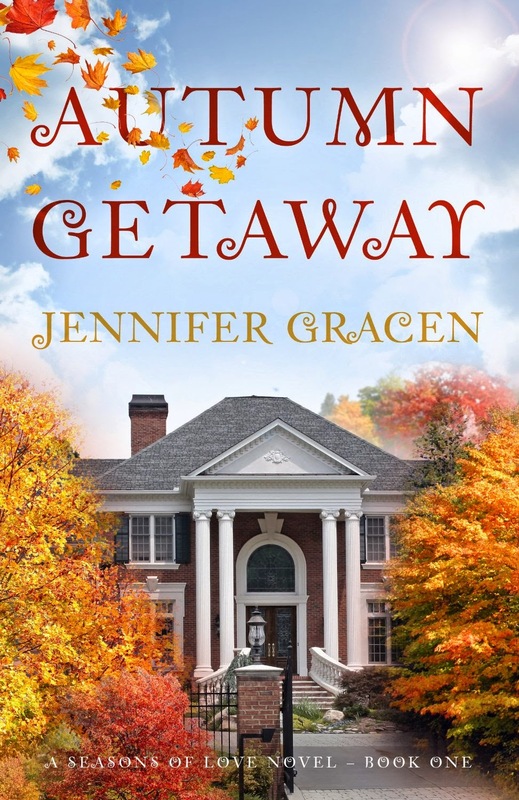 Introducing Autumn Getaway by Jennifer Gracen! A new contemporary romance, released March 27, 2014 by Booktrope, and available from Amazon and Barnes & Noble. When she meets Sam, a handsome friend of the groom, she's nearly overwhelmed by a confusing mix of hope and trepidation. Their instant connection feels intensely real, to both of them, but the ink is barely dry on her divorce decree. It takes all her nerve, and more than a little prodding from her girlfriends, to convince Lydia to give her heart — and Sam — a chance. But when the magical weekend comes to a close, Sam must return to Chicago, while Lydia heads back to her complicated life and young son in New York. Can their newfound connection survive the trials of physical distance and years of emotional baggage? Written with an appreciation for the day-to-day struggles of a newly single mom, Autumn Getaway explores the burdens and blessings of family, revels in the spirit of friendship, and celebrates the power of romance and hope as Lydia and Sam take a second chance at love. “One moment, Ms. Powell,” the man nodded as he turned to the computer. “I have a confirmation number in here somewhere,” she said, and started to dig through her large pocketbook. “Ugh, this thing is too full of junk.” She found a half-eaten chocolate chip cookie wrapped in a napkin, the slip for the dry cleaners she’d been unable to locate the day before, and one of her son’s omnipresent tiny racecars — but not the folded printout with her confirmation number. Her heavy, bottomless bag started to slide down her arm as she continued her frantic search. Trying to catch it, she moved enough for her leg to bump her suitcase, which fell over with a thunderous slam as it hit the marble floor. The sound reverberated off the walls, and she flushed with embarrassment. Heads turned, and in the ensuing silence, Andy’s little red car tumbled out of her bag, hit the floor with a metallic clang, and rolled across the lobby at top speed. Lydia just stared down at the suitcase and laughed. “Typical me,” she muttered with a self-deprecating shake of her head. "Welcome to the fancy hotel, klutz." “Here, let me help you with that,” said a deep, smooth voice. She hadn't even realized it, but a tall, dark-haired man was at her side, leaning over to lift her heavy suitcase back to its upright position. “Oh— thank you,” Lydia said, looking up to smile in appreciation at her helper. The man who stood before her was drenched in sweat, beads of it still shining on his forehead and running down the sides of his face. His gray T-shirt was darkened in spots, wet as it clung to his lean frame. He wore shorts, sneakers, and was carrying an iPod; he had obviously been out for a run. He had appealing dark eyes that were sweeping over her face, a day's worth of scruff on his chin, and a bright, affable smile that was contagious. Her smile automatically broadened in response, without her even being aware of it. She glanced at her righted suitcase, then back up at the man beside her. “That sounded like a bomb went off, huh?” She smirked. “As you should. You never know when a Lightning McQueen car will come in handy.” His warm brown eyes seemed to twinkle as he teased her. "Absolutely!" she joked back. God, he's good looking. And he'd known the name of the car. Her smile grew wider as she said, “Well, thanks for the assist. Very nice of you." “No problem, my pleasure.” He was staring at her, and seemed to hesitate for a second, as if he were going to say more. Instead, he just smiled again and said, “Well, have a good day.” As he strode away towards the grand, sweeping staircase that led to the upper floors, her eyes followed him. “I have your reservation here, Ms. Powell,” the man behind the front desk said. Jennifer Gracen hails from Long Island, New York, where she lives with her two young sons. She loves to write contemporary romance for readers who seek better days, authentic characters, and satisfying endings. When she isn’t taking care of her kids, doing freelance copy editing/proofreading, reading, or talking to friends on Twitter and Facebook, Jennifer writes. And a result of that writing is the 4 book SEASONS OF LOVE series, published by Booktrope Publishing. Book 1, AUTUMN GETAWAY, will be released in April 2014. Jennifer is a member of the Romance Writers of America and is active in the Long Island Romance Writers (RWA Chapter 160). In 2014, she is serving as Secretary for the LIRW, her first time as a board member. She’s shocked her family hasn’t yet staged an intervention for her addiction to social media. Autumn Getaway by Jennifer Gracen is a new contemporary romance, published by Booktrope on March 27, 2014 and available from Amazon and Barnes & Noble. Stay tuned, review to come! Sounds like a fun romance. Congratulations Jennifer!